We’ll use CoreLocation to access the user’s longitude and latitude. It’s an iOS system framework, so no need to install it with CocoaPods. Before we can start using CoreLocation, we need to configure our app’s privacy settings. We can’t access the user’s location without asking them first, and we only need to use their location when they have the app open. You want to add the Privacy - Location When In Use Usage Description property. This tells our app that we want to be able to access the user’s location. Set it to be a String and then add a value that describes why we need to access their location. Now that we’re configured to use CoreLocation, we can go back to our WeatherViewController. We need to import CoreLocation and add a CLLocationManager property. We also need to turn our WeatherViewController into a CLLocationManagerDelegate. This way, the Location Manager can send us information. Note how it includes that description we included in our Info.plist. 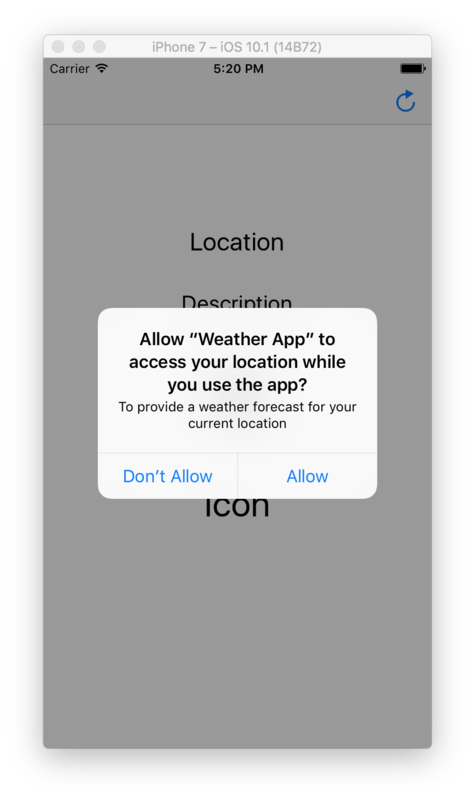 Once you tap Allow, the app will authorized to access your location. That function call doesn’t actually give us the user’s location, though. CoreLocation will pass the coordinates to the Location Manager’s delegate, which happens to be our WeatherViewController. The Location Manager will always call one of these methods after we call locationManager.requestLocation(). Now that we have a proper forecast for the user’s location, we’ll update the text labels to show the temperature, an emoji representing the weather, and the city name.